You will notice the only item on the chart that is excluded from the Fat-Burning Machine program is sugar. There are six other categories that are considered limited. Let me explain. Avacado, olives and coconut are in the fruit category. They are considered fruits by people that classify plants. Due to the low sugar content of these fruits, they would be considered “allowed” in the Fat-Burning Machine column. Berries and melons are considered low-sugar fruits, by serving size compared to other fruits. At Fat-Burning Machine, we are not only concerned with the sugar content of foods, but also with how fast that sugar gets absorbed by the body in a normal serving size. Your goal is to minimize food impact on your hormone insulin – the fat-storage hormone. The Best Fruits Chart can be found at this link. To get started, begin with the fruits that have a glycemic load less than 5. Some of you may find that these fruits make you more hungry. If that is the case, you will need to make some adjustments. Others will find that by limiting the serving size to the amounts shown on the list at the link above, all fruits can be consumed with no adverse consequences. This is where individual fine-tuning is needed – and great! There is no reason for you to eliminate foods if it’s not necessary. Keto and Paleo diets like dry wine because it is low-carb. It doesn’t matter if any given alcoholic drink is low carb or not, alcohol shuts off your Fat-Burning Machine. If you decide to consume alcohol, do so in limited quantities. Carrots are similar to fruit in that yes, carrots are starchy – but – they have a low glycemic index. Fat-Burning Machine encourages raw carrots as a snack. All other starchy vegetables could be used in place of rice, bread (etc.) as one of the “optional” foods at breakfast or lunch. See Low Sugar Fruits above. 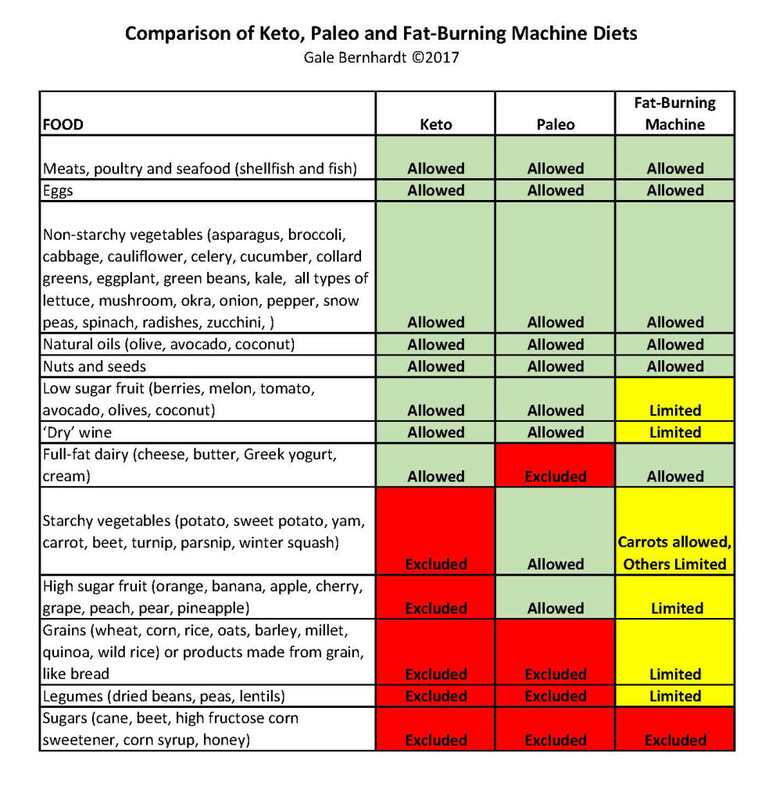 Keto and Paleo completely eliminate all grains and grain products. Fat-Burning Machine allows a serving of bread, grains or starchy veggies at breakfast or lunch as an option. Similar to starchy vegetables, legumes can be used as an optional serving. The way the Fat-Burning Machine plan is structured, food noted as “allowed” can be consumed at any meal or snack. All the foods classified as “limited” can be consumed in listed quantities and at strategic times (more on this later.) By being more thoughtful about what foods you eat and when, you can consume a wider variety of the foods you enjoy and still be a Fat-Burning Machine. This entry was posted in Home Page Feed, News & Media, Nutrition and tagged Fat Burning Machine, Keto, Paleo.